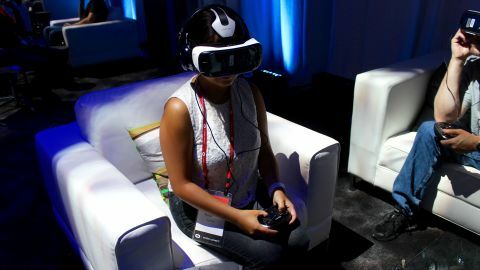 Oculus started off it's developer conference by announcing a brand new Samsung Gear VR headset that will fit both the Galaxy S6 and S6 Edge along with the Note 5 and S6 Edge+. This version of Gear VR will be the finalized consumer version and will be out November 2015 for only $99 (about £65, AU$140). Netflix is also a new feature that will be available when the new Gear VR comes out, along with several other streaming services that allow you to watch with friends. If you've been using the S6 Gear VR, these features will be available to you as well. If you're willing to plop down $199 (£199, about AU$251) and live in the States, you can now pick up the new Gear VR headset from both Samsung and Best Buy online, and in stores May 15. Global availability has yet to be announced. Samsung's relaunch of the Gear VR so soon after the last model is odd. Everyone expected it to be a simple case of sticking your new Galaxy S6 in the same port and it would work just fine. It's hard to work out whether anyone would be annoyed about Samsung bringing out another model so soon after the last one. It's always irritating when a company does that, but in this instance it feels like getting angry about a brand making a new case for its new phone, rather than using the one from last year. It's a very expensive case, admittedly, coming at nearly £199 (around $300 / AU$400) if it follows the same pricing strategy as 2014's Gear VR. But it's designed for the new phones – the Galaxy S6 and Galaxy S6 Edge – and there will be very, very few people that bought the Gear VR for the Note 4 and were looking to get the next model so soon after. If you've seen the Note 4 Gear VR version, you've seen this one too. It's precisely the same, except for the fact it's a little bit smaller (less phone to chuck in there) and a little lighter – plus the straps have been modified to provide a more comfortable fit. The side panels are still present and correct for navigation and moving through the interface, so a judicious amount of swiping and tapping helps you navigate through the myriad Samsung options and menus in the Milk VR app. They are also slightly shrunken though, with very little loss in usability it seems – that wasn't a hard mark to hit, as they weren't that accurate on the Gear VR anyway. I still found the device slightly uncomfortable to wear, as the lenses are slightly too close to your eyes – anyone with lovely and attractive long eye lashes will find they crush against them and distort the image. The focus jog wheel on the top of the new Gear VR is a little stiff, but I get the feeling that this would actually help lock in the clarity of what you're watching without constantly moving around and adding the fuzz. I only had a limited time with the new Gear VR, so there were a couple of things that I wanted to try out. I firstly had another look a the 360 film of a circus (slightly different to the one used on the Samsung Galaxy Note 4) to work out if the picture was any more clear, as the previous model was cool, but had very clear pixellation thanks to blowing up the image. It is still slightly fuzzy though, which is a slight shame. I was hoping the improved 577ppi of the smaller screen on the Galaxy S6, while still offering the same QHD resolution, would have made it better. However, I still think it's excellent for watching videos, and something I'm keen to do more of. It does need to be a slightly less chunky design, but the overall use was good as a home entertainment device. Gaming was cool too, although I only played a small 3D platformer that was just me running a troll through some doors, then occasionally setting his stick on fire. Not the most engaging, but I didn't care. Because being able to look up at a volcano, or look down at the canyon, was brilliant. It's so simple, but combined with the Bluetooth gaming controller I can see this being a real reason for developers to get on board. There's not much new on the Gear VR (S6 edition). It's the same thing that's been through a slight bodyform, making it 15% lighter and with more ergonomic straps. The lower pixilation wasn't apparent during my time with it, but playing in the immersive world with the gaming controller was a new one for me – and I loved it. Is it perfect? No. But VR is one of those things that seems like it's becoming a real trend – and it's one of those times that you feel like it's just astoundingly awesome that I hope Samsung (and others) manage to push the message on properly.